VP7 is a tabletop pouch making machine used for packaging unit dose solids, liquids or cut to length films. The machine has 2 rotary sealing wheels. The wheels are made to fit the type of package being made. Speed: Variable from 0 to 60 packages per minute. Package Size: Package width from 1" to 2". Package length from 1 1/2" to 7"
Single and variable packages cut-offs or perforated are available. Packaging Material: Any heat sealable material can be run on the machine (paper laminate, aluminum foil). 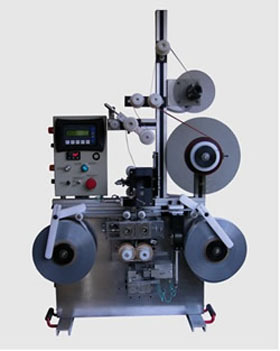 The machine will run unprinted film or random printed film.